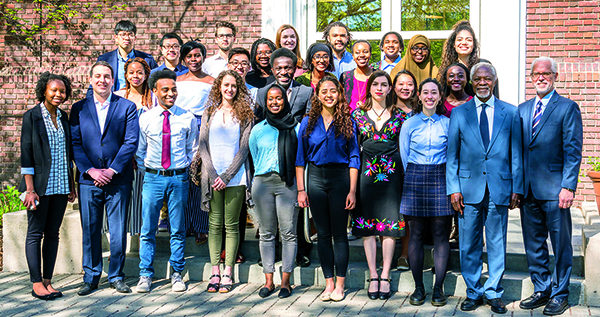 Kofi Annan ’61—founding chair of the Kofi Annan Foundation, seventh Secretary-General of the United Nations, and 2001 Nobel Peace Prize winner—came back to campus in May. During his visit, the college unveiled the newly renamed Kofi Annan Institute for Global Citizenship in recognition of his global leadership and dedication to peace. Annan also spoke with President Brian Rosenberg in front of a large crowd of Mac community members. Their conversation, edited and condensed below, featured Annan’s reflections on current global challenges, leadership, and his own journey. Brian Rosenberg: What are the essential qualities of a good leader? Kofi Annan: A good leader must have good judgment—a keen sense of what is right and what is wrong. You need discipline. You need compassion. Good leaders must also be good listeners. Above all, a good leader must also be a good follower. It’s counterintuitive, but a good leader cannot always be right. You cannot win all the time. There are people around you with ideas—and if they are good ideas and they are right, you follow them. You have to follow them for [those people] to follow you tomorrow. But not many leaders understand this. They think that’s a sign of weakness and that they need to be tough and strong. That’s not leadership. We seem to be living through a moment with a resurgence of leaders who perhaps have tendencies toward autocratic rule—and yet, many people seem to vote for them. What do you think is the attraction to that version of a strong leader? I think the politicians who are populist and xenophobic and push nationalist ideas are tapping into something. They realize that there is a large segment of the population that’s unhappy. And the world is changing very fast, so these people are disoriented, and they are really not getting any expression of hope and help from their leaders. They are desperate, so they listen to the individual who comes up and promises easy solutions. I have to blame, to some extent, the mainstream leaders who are not engaging with their people. There is a tendency for mainstream politicians sometimes to chase the extremist politicians on the right or on the left, thinking that’s where the votes are. And yet, if you speak to the people honestly, they will get it. You engage with the people and explain to them that, yes, the job you had is gone, it’s not coming back. Coal is not coming back. Some jobs went to China, but most of the jobs have been eliminated through innovation and technology. Tell them there will be new jobs coming, but they will require training—and that we will train you for it, and these are the plans. When they know there are plans and somebody’s working with them on their future, it gives hope. But when that conversation is not taking place, there is a tendency to look for the savior who can come, in one form or the other, with loose promises that will never be fulfilled. I think the social contract between government and the people has broken down in many countries and it has to be reestablished. Trust is gone. Trust has to be reestablished. With your foundation, you’ve focused on developing youth leadership. Is the best way to develop a new kind of leader to start with children when they’re very young and begin to teach them what leadership really means? The young women and men of today are really people of their times. They have more knowledge than we had, and they understand their world. They know what is going on and what is likely to come. And I think we should encourage them to get involved and begin to take over. I firmly believe that you are never too young to lead. And so I encourage young people with capacity and desire and willingness to play a role—and we should listen to them, because we have a tendency not always to listen to them. If I have a legal problem, I go to a lawyer. For an accounting problem, I go to an accountant. But until recently, if there is a youth problem, we make the decisions for them. We don’t consult them. I think that is beginning to change. How do you feel about the role of social media both in the proper functioning of democracies and also just in the creation of culture? I think social media has great potential. It can be used positively, but we have to admit it can be used negatively. If we have a system where people can be corralled into echo chambers and reinforce their prejudices. . . you are making it very difficult for democracy to work the way it should. It makes it difficult to have sensible conversation on issues of importance, to be able to come to a compromise. And one has to have a system of weeding out the blatant lies that sometimes affect how people vote. If I’m a voter and I have a feeling that elections could be interfered with directly or indirectly by groups of people playing games with social media and influence, why should I go and vote? Even before this became a real issue, some people didn’t vote because they weren’t sure their votes would count. It is very important that we do. At Macalester, you immersed yourself thoroughly not just on campus but around Minnesota and the United States. What importance did you see then in encountering people whose backgrounds, whose views, whose life experiences were different from your own? I found it fascinating to be working with people from different countries, different cultures, different religions. I found it exciting and I was curious to learn from them, and I have not lost that curiosity. And so having lived on campus and worked with all these students, later on, when I joined the United Nations, the idea of working in an organization with over 180 different nationalities wasn’t so shocking or so strange.